One of my greatest faults that shows up too often in our marriage is my firstborn perfectionism. When my husband tells a story but doesn’t get the details right, I barge in to correct him. Well, not publicly. But I file away the errors to sort out with him later. I’ve also found plenty of necessary reasons to correct his mistakes in pronunciation or in how he eats. The mother in me fixes his hair, straightens his jacket, and points out that his socks are all wrong with those shoes. I like to disguise it as helping. The problem is Dennis isn’t so easily tricked. Maybe in your marriage you’re guilty of something more than consistent correcting. Admittedly, we all commit actions in our marriages that offend each other. So we repeat a practice as worn and reliable as the ancient stone steps leading up to the temple in Jerusalem. We practice forgiveness. I don’t like being wrong. I’m sure you don’t either. So asking forgiveness isn’t easy, even after over 40 years of marriage. It requires a choice to recognize my sin, confess it, and ask for understanding. So I am grateful for Easter, and Jesus’ finished work on the cross, for making true forgiveness possible. You see, Christian forgiveness is completely different from overlooking an offense or pretending it didn’t matter to you. Forgiveness is healing; it is transformative. It brings about a heart change that only Christ can accomplish. And that makes all the difference in a marriage. I recently sat across the table from a couple in their early 40s, who shared their story of infidelity. It was a crushing experience for both spouses. He felt deep regret. She felt deep betrayal. But even while they lived in this mix of emotions, they declared a determined commitment to choose to forgive and be reconciled. All three of us got teary-eyed. “Most everyone is telling us to quit, but we want to believe God for restoration,” they admitted. They are walking through the effects of sins and offenses that cannot be forgiven without the power of the cross. Every marriage faces these impossible-to-overcome crises. The inevitable disappointments are sometimes small and sometimes monumental. But Easter makes it possible to forgive any offense. Christ died specifically for you. And Christ died specifically for your spouse. While you likely both believe this, understand that this means Christ has covered the sins in your marriage. Your sins. Your spouse’s sins. If your sins are covered in Jesus’ forgiveness, the payment has been settled. Christ has taken on the suffering for your sins. And it is finished. So let the resentful, unforgiving wife forgive. Let the angry, unforgiving husband relent. He chose God’s plan, refusing to quit. He chose to keep His promises, instead of breaking them. He chose to love me as He suffered, because our reconciliation was near. 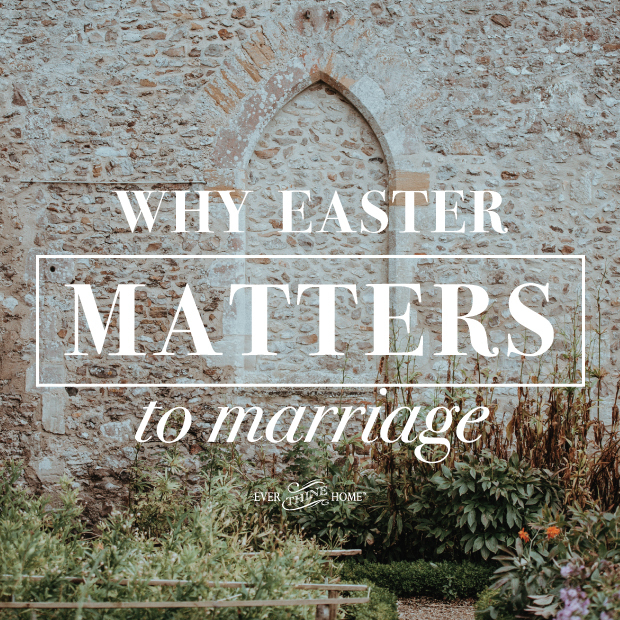 Easter shows us that if God can resurrect a dead Jesus—and He did!—He can resurrect dead marriages. If God can work all things together for good at the cross, He can work together seemingly impossible situations in our marriages for good. In Ephesians 4:32 we are told, “Be kind to one another, tenderhearted, forgiving one another, as God in Christ forgave you.” Yet forgiveness isn’t natural. Reconciliation with a spouse who feels like a fierce enemy isn’t comfortable. When two people drift apart and choose their own ways—and sometimes even choose other people—restoration doesn’t seem possible. That is what Christ has done for us. He can make the impossible parts in our marriages doable. He can use two humans—struggling to even decide how to discipline a child who scribbled toddler art on the bedroom wall— to display His unending, eternal, sanctifying, perfect love for mankind. I would love to encourage you and your spouse to go to one of FamilyLife’s Weekend to Remember marriage getaways. No matter where you are in your relationship, in a great place or in a tough spot, sign up to get solid biblical help & hope for your marriage. Find all available weekends here.